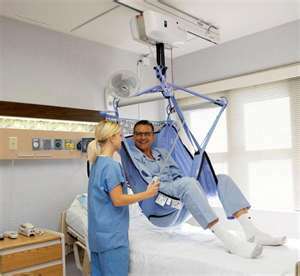 Hospitals and Nursing Homes use expensive ceiling track systems. Safe Patient Handling is a common topic among health care workers in hospitals and nursing homes across the country. Most of the patient handling which occurs in these health care settings is performed by nurses and support staff such as nursing aides and orderlies. These professionals are trained in safe patient handling techniques and the proper use of assistive devices. The following excerpt from the CDC regarding safe patient handling gives you an idea of the amount of time and energy health care facilities devote to a program that can protect both the patient and the employee. The rise of Home Care does not diminish the issue of safe patient handling, rather, it should only bolster the importance of understanding the principles involved. Safe lifting programs that incorporate mechanical lifting equipment can protect workers from injury, reduce workers’ compensation costs, and improve the quality of care delivered to patients. A work-related musculoskeletal disorder is an injury of the muscles, tendons, ligaments, nerves, joints, cartilage, bones, or blood vessels in the arms, legs, head, neck, or back that is caused or aggravated by work tasks such as lifting, pushing, and pulling. Symptoms include pain, stiffness, swelling, numbness, and tingling. Lifting and moving patients create a high risk for back injury and other musculoskeletal disorders for home health care workers. Traxx Mobility Systems manufactures a patient lift system for the home that addresses safe patient handling. The Titan 500 is a freestanding overhead patient lift that allows a single caregiver to safely transfer a patient without the fear of injury. The rechargeable electric motor does all the heavy lifting while the caregiver gently slides the patient across the beam to finish the transfer. Unlike a floor-based lift, the caregiver does not need to move the equipment with the patient in it. The systems fits over the bed and is essentially out of the way until it is needed. For more information on the Traxx Mobility Systems Titan 500 Overhead Patient Lift system, visit our website, find us on Facebook and watch our YouTube channel. As more health care moves in to the home, tried and true practices from institutional settings need to follow. Care must not degrade because of a change in venue. While costs for home care may remain lower than traditional nursing homes or assisted living facilities, care in the home must maintain professional standards for procedure. Granted, there are levels of home care; not all home care is medical. However, if medical care is being provided in the home, efforts must be made to provide the proper equipment and training for effective care. 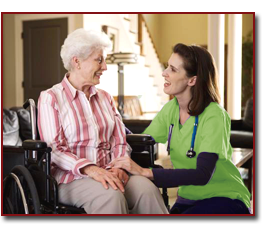 Home care patients who have limited mobility face challenges daily. Above and beyond the care they receive, modifications to the home often need to be implemented. Creating access to the various areas of the home can be challenging, and often, a new approach to health care in the home needs to be explored. Whether it is using technology to address access issues with staircases, bathrooms and bedrooms, or moving your living space to a more accessible part of the home, preparing your home for health care is the first step to maintaining a higher standard of care. Adding health care equipment to the home can be both liberating and frustrating. On the one hand, you have assistive devices to help with your mobility issues and on the other, that equipment may get in the way occasionally. Finding the right equipment can be extremely important. You need to find a device that can do the job safely and effectively. If a device is inexpensive, but difficult to use, it may not be the right piece of equipment for home care. Case in point, the floor-based patient lift. The device works great in institutional settings. Hospitals and nursing homes have enough staff on hand (two aides) to properly use the device. Smooth flooring surfaces and large rooms without furniture or clutter make the lift easier to operate safely. The same device, which Medicare will cover fully, can be a nightmare to use in the home. Typically, a patient will have only one aide as well as a room full of furniture and carpeting. Not the ideal device for the situation as it can contribute to unsafe operation as well as a higher risk of caregiver injury. 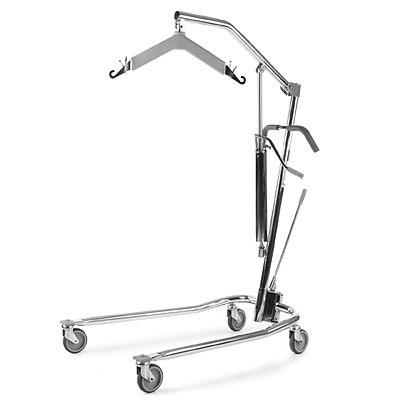 Traxx Mobility Systems manufactures a freestanding overhead patient lift designed for home care. The TITAN 500 lift system allows a single caregiver to safely transfer a patient without risk of injury. It does not attach to the structure so it can be used throughout the home in different situations. An overhead lift can provide a lift experience that is safer, more comfortable and even more dignified. The system ships as a complete system, sling included, all at one low price. Visit our website for more information on the TITAN 500. You can also find us on Facebook and watch our channel on YouTube. Contact us for a free quote at 855-872-9967. Take a realistic look at your loved one’s situation and be careful not to fool yourself into complacency. Making plans and decisions about the future care of your loved one is much easier to do when you’re not in the midst of some medical crisis.